These 6 books of mine are all on all the streaming sites, Amazon, I- books, Barnes and Nobel, etc. Lots of variety! Try one and see. 4. TEN SHORT AND SHORT-SHORT PLAYS. Hendricks obviously is a good writer and also knows the theater well, since his plays can easily be produced by small theater companies without the aid of elaborate scenery, large casts, etc. He also knows how to make things concise and easily understood. – Raanan Geberer. Playwright Tom Hendricks must have an incessantly creative mind, and this comes through in each of his unique and playful works. Each of these plays would be fun to act out for novice actors or for ones much more skilled. I recommend Ten Short and Short-Short Plays to readers who enjoy short works of fiction, those interested in fun short plays, or actors looking for new work. Tom Hendricks’ work is definitely worth watching out for. – Chris Fischer. Renown leads him and his friend Tom downtown to the Clarks Hotel. But how will they get inside, and what treasure will they find if they do?” Though I thought this blurb intriguing, I also felt it a little meager. As it turned out, it was perfect and the answer to the question was not close to anything I imagined. – Lex Allen. 6. WRITINGS IN SCIENCE. Writings in Science, a history of the future in stories, essays, poems and plays. Writings in Science: A History of the Future by Tom Hendricks is a dazzling portrait of the world millions of years from now, as seen through the eyes of the character called “I.” It is the kind of sci-fi that can be characterized as visionary. – Divien Zape. A History of the Future by Tom Hendricks is a beautiful collection of stories, dialogues, essays, and many things in between, depicting the world millions of years in the future. Readers will enjoy the drama that features in the stories, the tight prose in the essays, and the compelling, somewhat symbolic characters. Tom Hendricks exhibits a very rich imagination in this entertaining work. The author covers a variety of themes in a variety of styles, including ethical issues, scientific inventions, culture and politics. The Setting is captivating. I was drawn in by the images the author conjured through the beautiful writing. It’s a work that will be adored by fans of sci-fi, short stories, futuristic essays and fantasy. – Arya Fomonyuy. Writings in Science: A History of the Future by Tom Hendricks is a collection of poems, essays and stories all compiled into a novel, written in two parts. The reader is taken to a world where the earth is no longer viable and is, in fact, dying because of the sun. People are leaving the blue planet in droves and one man with the name of “I” works to gather his favorite science writings to preserve them as a legacy for the future. Follow the history in this book and all of the changes that have happened to the planet before it began its death throes. – Kathryn Bennett. The Christmas, special issue of Musea that was the kid’s novel “Downtown With the Book of Renown”, is now on the Musea.us website – or rather a teaser of it is. Thanks to Webmaster Matthew for this. This is the 2nd good review I’ve gotten for Downtown. Five of Five Stars! Though I thought this blurb intriguing, I also felt it a little meager. As it turned out, it was perfect and the answer to the question was not close to anything I imagined. I would not have known what to write as a review of this little story had I not done some investigation into the author and his other published works. With that information came enlightenment, so to speak. That Downtown with the Book of Renown is a well written, delightful read is, for me, a positive sign of Mr. Hendricks’ imagination and writing skills. That it is also far off the current standard for fiction storytelling regarding plot, characterizations, dialogue, narrative detail and backstory is both intriguing and refreshing. It reads more like a script or screenplay, with little location description or narrator detail. Dialogue is written with the name of the speaker, followed by a semi-colon and then the words. There are no adverbs or adjectives to show the speaker’s emotional state; the author leaves that to me (and you) the reader. Excellent! Conversely, it misses the mark of purebred script/screenplay by quite a lot, as well. I discovered that all of Mr. Hendricks’ written work follows this style to some degree and that it is intentional. The author’s stated goal is to “give an alternative to generic corporate arts.” He has accomplished this objective with resounding success. I am a new fan and I will read more by this author. Thank you Rex Allen for your review. I’ve written in this style so long I forget it’s not the normal style. I appreciate that you went outside the novel to see that. My reason for it is to get the story going and never stop it or interrupt it for excess explanation or descriptions. A lot happens, and we learn a lot of personality in the dialogue and events. Compare how Brad’s parents tell the opening scene story with how Bradley tells the story. Or did you notice how many times poor Bradley got cut throughout the story? I think there is enough layers of fun to read it a couple of times and see more each visit. In big events there is a lot that happens quickly and I wanted to express that exciting atmosphere. The writing is sort of a hybrid of novel and play. Hopefully I mixed the best of both to get a quick moving read. I got my first review for my kid’s mystery Downtown With the Book of Renown. Here it is, or see my blog. Downtown With the Book of Renown: Question Mark is a young adult short mystery story written by Tom Hendricks. Tom and Brad love mystery stories, and the two boys found themselves right in the middle of their own mystery/adventure after Brad’s strange accident outside the basement cafe where he and his parents were eating. Brad had finished early and decided to look around outside the cafe while his parents finished their meals. A large man rushed out from behind them and raced to the door, knocking into Brad and causing him to fall down. Brad was trying to get back onto his feet when he heard loud voices and gunshots from the street level. He could see the fat man’s body half hanging over the wall over his head, and he noticed the man’s hand opening. A small black book fell from his fingers and landed right near Brad’s shoe. He couldn’t help but grab it and put it in his pocket. What he found inside was quite irresistible indeed. Who can resist the lure of a treasure map? I certainly couldn’t, nor would I have expected mystery buffs, Tom and Brad, to do anything more than follow the clues. Tom Hendricks’ short mystery story for young adults, Downtown With the Book of Renown: Question Mark, sparkles with excitement and energy as the two adventurers travel downtown in search of treasure. The reader is privy to the enhanced effects their enthusiasm lends to even the most prosaic everyday scenes witnessed from the windows of a public bus, and one can’t help but get more and more involved as they near the spot marked X on the map. 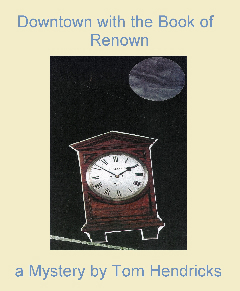 I had a marvelous time reading Downtown With the Book of Renown. Tom and Brad’s adventure was reminiscent of those classic Hardy Boys adventures I grew up reading, and I’m sincerely hoping to read more of their further adventures. While geared toward a young adult audience, preteen readers and adults who are still young-at-heart will most likely enjoy Downtown With the Book of Renown as much as I did. It’s most highly recommended. The review website allows the author to reply to his reviews. Here is my reply Jack Magnus, thanks for your review. Downtown will most likely be the first and last adventure for the boys. I have many projects going, and this book project was one of them. I had taken notes for it for at least 15 years. It had a number of plots that were interwoven, etc. I don’t think that will happen again. Though I do have a film script where two boys find a rocket in a cave …. Perhaps I can tie Tom and Brad into another novel as minor characters that my readers might remember from this. PS just for fun, I grew up with a friend named Brad Baker, and my name is Tom. This was something we probably would have gotten into if the circumstances had happened to us. It was part tribute to our friendship and the fun we had. My latest novel, Downtown With The Book of Renown, a kid’s mystery, was also my annual Christmas story for the year, something I’ve been doing for over 10 years. But readers may wonder where the Xmas was. Let me explain, I had planned this short novel for many years. i thought making it my Xmas issue would get me to finish it. But to make it official, I had to tuck in at least one Christmas reference. Here it is. The two boys are going to the Clark Hotel on the Bus …. They sat down about half way back on the left. Brad checked his pocket for the Book of Renown and tapped it three times for luck. Across the aisle a young man with round glasses had his Bible opened and he was reading out loud. The boys looked at each other and shrugged their shoulders. Behind them a few rows was a couple of small, quiet, heavy set ,women who looked old to the two. No one else was on the bus. Outside the big windows the city was all lit up. It paraded by on both sides of the bus. Night lights and neon were everywhere. It hid the dirt and litter underneath. It was like being inside a Christmas tree with all the edges lit up. There was a ding of a bell and the man reading the Bible stopped, folded it up, put it in his briefcase, locked it, pushed up his glasses on his nose, and went out the front door.